Growing your business does not always mean new customers. If you focus all of your efforts on finding new customers, there is a danger that the current customers might not hang around for very long. If you can get a few more customers to spend again that can unlock huge growth within your business and increase your profits by up to 125%. Increasing your customer retention can make a huge difference to your financial performance. Here are some of the most regularly referenced statistics about customer retention. You spend all that time creating a fantastic website that converts or a sales funnel that works like a dream. But if you don’t have an way of keeping those customers once they’ve purchased, then they could just walk straight through your business. The outcome is lots of new customers, but not many retained customers. You’ve elevated potential customers to the sale, they’ve then slid through your business and might not come back. 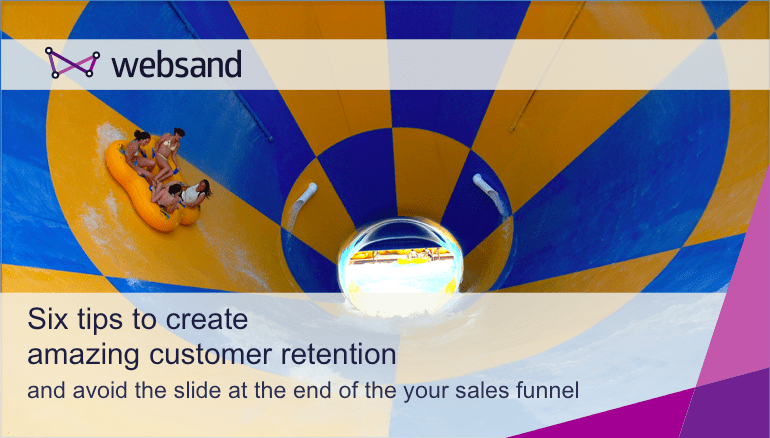 Your sales strategy is feeding a waterslide running through your business. Customer retention is the same as sales really, but focused on your existing customers rather than finding new ones. The way that a business retains customers will depend on the type of business you are running but it it will require a mix of service (is your offering really good), support (also known as account management) and communication. So here are six tips to improve customer retention (or) six tips to stop the waterslide and keep your customers afloat. Sales funnels are used to influence behaviour within prospects. To get more information from prospects and ultimately to get them to buy from your business. Marketing people tend to use the term ‘customer journey‘ rather than sales funnel. It is the same concept, using communication to inform (and nurture) customers with relevant information. If the information you share is relevant and timely then this will help develop the relationship with that customer, this ultimately helps to increase the likelihood of future sales from that customer. A great starting point is to build customer journeys around the recency, frequency and spend of your existing customers. You will have someone responsible for sales, but who is – or who will be – responsible for customer retention. It tends to fall into the responsibilities of the marketing areas of the business, but to be effective and to make this behaviour part of the business as an ongoing process, it is strongly recommended that someone is assigned to be responsible for this area of the business. Set a customer retention benchmark. Look at how many customers currently make a second purchase. Look to increase that number by 10%. Understanding where each customer or prospect is in the ‘customer journey’ or ‘sales funnel’ is really important. At each stage of your customer journey, the customer will meet a certain profile or will have completed a specific behaviour. It could be customers that bought a certain product 23 days ago? Perhaps it’s customers that live in a certain location. Or it’s people that have just signed up? Applying customer segmentation to the customer data you collect will allow you to easily identify customers at each stage of the customer journey you’ve created. Creating these groups also help you to make sure that the content you send to these customers is as relevant as possible – unlike a traditional sales funnel when you are seeking information, in this case you are using the information you already have to influence customer behaviour. The behaviour of your customers cannot be planned and the data you collect is fluid not static. The customer segmentation you create and the marketing messages that you are using to communicate to customers at each stage of the journey need to be automated. Using marketing automation software, such as Websand, will ensure that your customer data is always managed into the customer groups you’ve created and that your marketing messages are always sent at the time you need them to be sent. That is personalised, relevant to the audience and in context to the behaviour of the customer. Measure performance against the goals you’ve set in stage 3. If performance drops below the desired level then adopt an agile marketing mindset. Do some tests and change either the customer segmentation rules or the content of the marketing message you send to that audience at that point in the journey. If you want some help to build an amazing customer retention strategy for your business, or you are looking for the software to bring your customer retention plans to life, we can help. Click on the button below and get started with a 14 day free trial of Websand.